Monkey Space is a new 3-dimensional structure set to revolutionise training. Self-standing and highly modular, with a cubic base, it comes with a constantly evolving range of training tools and accessories for customising routes. In short, Monkey Space offers infinite possibilities for training in a safe, ergonomic environment. Initially available in 4 sizes, it enables climbers and gymnasts to develop their technical and physical skills, for all standards! This new training tool is constantly evolving, easy to assemble, user-friendly and great fun. 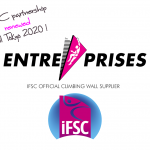 It is the perfect fit for any climbing or fitness gym or multi-sport centre seeking to enhance its customer experience. A system of locking clips means that every training tool and volume can be moved in seconds without special tools. As a result, this easy-to-use system offers infinite possibilities for designing and adapting routes throughout the entire Monkey Space, using its walls, roof, and hanging accessories. In this way, users of every standard can invent, test, modify and play to their hearts’ content, developing their skills in the way that suits them best. An all-embracing, highly appealing way to train! Highly user?friendly and great fun: users can customise their own circuits to suit their standard and training frequency: training can be broad-based or specific, and constantly tailored to each user’s requirements. It can be a game too, involving one-on-one competitions and challenges! Highly intensive: Monkey Space fires climbers’ imaginations: They can devise climbing moves to work on their coordination, explosive power, strength, core stability and speed! Progress is guaranteed for novice and advanced climbers alike. The mechanical locking system enables volumes and training tools to be easily fixed, with ergonomic shapes and materials to prevent injury. 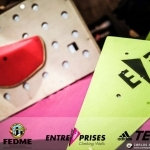 With this unique concept, climbers learn and develop skills in an environment that is modular, adaptable, user-friendly, fun, constantly evolving… and safe. Monkey Space is delivered in kit form. It can be assembled using just a few tools, but an optional installation service is also available. Two new “pluggable” accessories will be released each year so the space remains fresh and up-to-date! The dedicated website: http://www.monkeyspace.entre-prises.com features videos and photos of events and training on Monkey Space.